KAMPALA– St. Augustine College School, in Wakiso district is set to dig deep in its pockets after a journalist suing it together with its teacher Kennedy Akena for allegedly assaulting him while in his line of duty which infringed and violated his rights. According to the court documents filed in the High Court Civil division, William Mutyaba a journalist presently employed by Vision Group’s Bukedde Television accuses Akena of ordering students to beat him while he was recording the fire outbreak that had gutted one of the school dormitories. Mutyaba, a resident of Kayunga near the school says that he was tipped about the fire outbreak and he immediately grabbed his camera, boarded a motorcycle and proceeded to the school and upon reaching its gate, he found it unmanned, opened and found Akena together with the other people rushing inside to see what was going on. He goes on to state that Akena upon learning that he was recording the fire incident, he criticized him for previously airing a story about the previous fire outbreak at the school thus calling upon the students to beat him who did not respond immediately because they were preoccupied with the fire rescue. “After hearing Akena’s utterances, I sensed danger, picked up my camera and started to flee the scene, however for the second time he (Akena) emphatically commanded the students to beat me up and alleged that I was the one who started the fire. I ran towards the gate but students continued to chase me,” Mutyaba says. 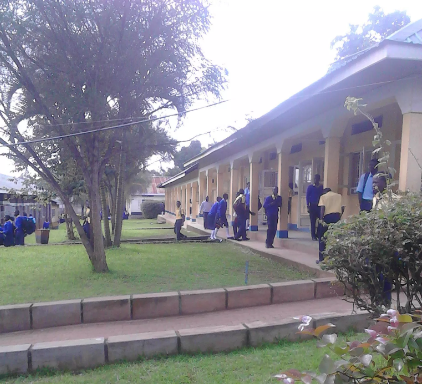 Mr Mutyaba goes on to say that Mr Akena ordered the gatekeeper to lock the gate so that I could not exit the premises and this is when the students pounced on him slapping, hitting punching and kicking him several times on different parts of the body. Mutyaba through his lawyers of Walyemera & Company Advocates wants a declaration that the school is vicariously liable for the irresponsible, wanton and illegal actions meted by Mr Akena while in the course of his employment as a teacher and that the school should be consequently liable to compensate him Shs 80million. He also wants a declaration that on July 27, 2018, the cruel, unlawful and vicious acts of Aken slapping, hitting, humiliating and assaulting him as well as inciting students to assault him while in his line of duty infringed and violated his rights.